If there is Chilli Aloo or even Mysore Bonda, there must be Dum Aloo right? 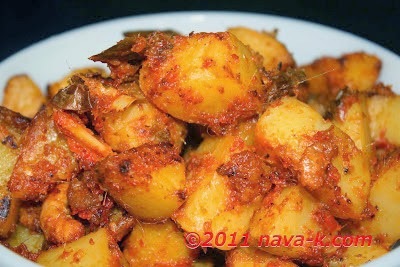 Or maybe I must also include our Malaysian Spicy Potato Ikan Bilis? Most probably. But this Dum Aloo. No. no. Not the standardized kinda. Its actually the Malaysian version to a Dum Aloo. Why? Potatoes (Aloo Gobi) stir fried alongside lemongrass and chilli paste, dried shrimps, tomato and of course, we need shallots and curry leaves. A winning Malaysian cooking formula right? For a vegetarian version, do the right thing. Omit dried shrimps. When oil is heated, fry dried prawns till crispy. In the same oil, saute shallots. Add chilli paste and tomato. Cook till oil splits and for a thick mushy paste. Add potatoes and curry leaves. Keep stirring until gravy dries up. Give a couple of stirs and dish out. looks yummy..just like anchovies with potato too..
wow...what a lovely recipe....I hav never used lemon grass before.....can you tell me if it goes well in non veg dishes ? Sonali - yes, can be added into non-veg dishes for the fragrant. Sharlot - very easy to prepare, do try out. Karen - will post some non spicy soon. Yes Sharon, do try and your feedback is appreciated.